Standard Android comes with basic VPN abilities that are adequate for most consumers. But many enterprises need better security and more flexible VPN controls for larger deployments. 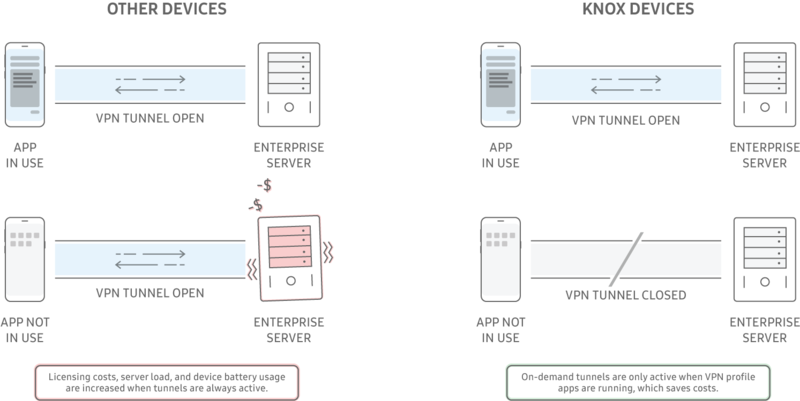 The Knox VPN framework includes the most advanced enterprise-focused feature set, which ensures that VPN connections are efficient, reliable, secure, and compliant with industry regulations and best practices. The Knox Platform VPN framework allows the integration of third-party VPN clients in addition to the built-in VPN client. The Knox Platform VPN framework supports all common VPN types, protocols, and configuration options. When deploying VPN solutions, enterprise IT admins must ensure VPN deployments work smoothly, don't waste server resources, limit the VPN solution licensing costs, and enforce strict security policies that prevent data leakage. The flexibility to use a VPN tunnel for the entire device, the Knox Workspace only, or a single app only. The unique ability to use a single VPN tunnel for traffic both inside and outside the Knox Workspace, without requiring separate VPN clients and licenses. The cost saving benefit of using VPN tunnels on-demand, only when apps in a VPN profile are running. The convenience to bypass VPN tunnels when a device is on-premise in a local corporate network. The strict coverage of corner cases to prevent data leakage outside of VPN tunnels, even during a device boot. The ability to connect multiple tunnels simultaneously. The extra security of chaining VPNs (also known as cascading or nesting VPNs) for greater anonymity, for example, in classified deployments. Web proxy configurations are tunnel-specific. Web proxy support for NTLM authentication, basic authentication, PAC, and PAC with authentication. QoS or traffic tracking and shaping. The Knox VPN framework can inform the VPN client when any installed apps generate any traffic. Automatic reconnection of VPN tunnels when the server side disconnects. Server-side disconnections are more difficult to detect and handle than device-side disconnections, which are usually related to detectable conditions like loss of connectivity or the presence of new network connections, such as a new Wi-Fi connection. During a download, VPN tunnels direct download manager traffic to the VPN tunnel tied to the app that requested the download. VPN tunnels handle system events such as power saving mode entry or exit, package addition or removal, connectivity changes, and admin app changes. VPN profiles can specify which non-present apps must also use a VPN tunnel if they are ever installed. Even the free, built-in VPN client supports all the advanced VPN features listed in the previous list items. Handle captive portal prior to VPN tunnel establishment.